NEW ORLEANS – Yesterday might have flown under the radar for many, but not for those of us who are stewards of The Bowerman Award. And no, that’s not because it was Stone Cold Day (March 16 or 3:16). For those who don’t know – or need a refresher – The Bowerman Award is collegiate track & field’s highest individual honor, like The Heisman Trophy is to college football. Now in its 9th year of existence, The Bowerman Award has been given out to 16 incredible athletes (8 men, 8 women) – many of whom have gone on to have unmatched success at the international level. Long before an athlete joins that elite fraternity or sorority, he or she must do enough throughout the year to be named a finalist. Before that, he or she must be a semifinalist. And before all of those other things, he or she must land on The Bowerman Award Watch List. On Wednesday and Thursday of this week, the U.S. Track & Field and Cross Country Coaches Association (USTFCCCA) released the most recent Watch Lists for The Bowerman Award – one for the men and another for the women. 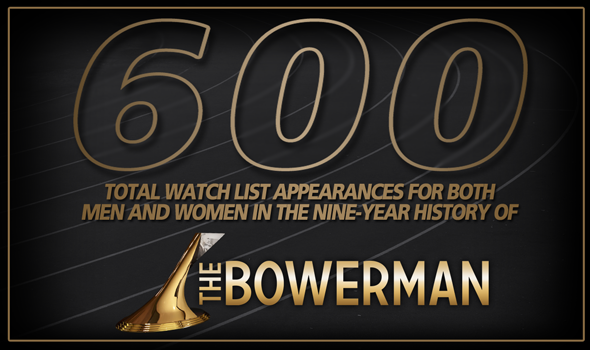 Ten athletes were on each Watch List, bringing the total number of all-time appearances – for each gender – to 600. Let’s take a closer look at those mentions and see what we can make of this historical moment. • Throughout the years, 122 men and 115 women have totaled those 1200 appearances on the Watch List with three men and three women appearing 20 or more times – Edward Cheserek, Lawi Lalang and Ryan Crouser for the men and Brianne Theisen, Kendell Williams and Kimberlyn Duncan for the women. • Oregon star Edward Cheserek is the unrivaled king of The Bowerman Award Watch List, appearing a record 25 times on these pages. Cheserek just broke a tie with former Arizona standout Lawi Lalang for most all-time mentions (Lalang had 24). • The teams with the most Watch List appearances are Florida on the men’s side with 83 and the Women of Oregon with 94. Expect the Ducks’ number to continue to soar as they had five on the most recent Watch List that was released March 15. • Speaking of Florida and Oregon, those are two of the three programs with 10 or more athletes on the Watch List. The Ducks headline that group with 14, while the Gators are close behind with 13. Both programs from Texas A&M had exactly 10 athletes named. • There have been 80 teams with at least one appearance on the Watch List. Of those 80 teams, 15 have only had one athlete mentioned once. Ten are women’s teams: Lincoln (Mo. ), Michigan State, Minnesota, Missouri, Omaha, Purdue, Sacramento State, Shippensburg, Southern Miss and UMKC. The remaining five, of course, are men’s teams: Iowa State, Kentucky, Minnesota State, South Carolina and Tulsa. • When you break it down to the conference level, the SEC is dominant in both the men’s and women’s Watch List with 438 of those 1200 combined appearances. That nearly matches the total number of appearances by the Pac-12 and Big 12 combined (460). There will be four more Watch Lists for each gender in 2017 before semifinalists are named June 15. One week later we’ll find out who will join us as finalists in Phoenix at the annual USTFCCCA Convention!